Tyche Properties: Single Property Real Estate Themeis best solution for both Real Estate Agencies and Property Owners. 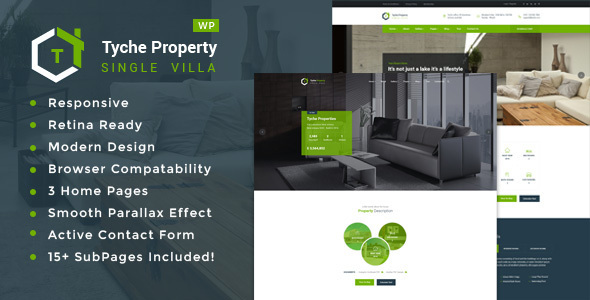 Nowadays sale of property by the owner more popular and Apart Villa is specially crafted for such websites.This Theme has Multi-Pages option also that very useful for Real Estate Companies. Tyche Properties is right fit for selling your Villa, Land, Apartment, House and Raw House.ThisThemewill provide you best details page and tour page that will describe your property well. It will be very helpful for selling your property and advertising your property. Tyche Properties is ready to use from the box. Quickly install it via FTP or WordPress and after you activate it you can load demo content. Then you can add your own content on already designed pages. Install Tyche Properties with our powerful one click installer. Get your site up and running in no time! Quick, easy and rocket fast! Look of your website on mobile devices is very important these days. So we made sure Tyche Properties looks great both on mobile, desktop and retina screens! Tyche Properties is compatible with most popular WordPress plugin that supports creation of multilingual layouts. Translate your website to any language with WPML! Tyche Properties is compatible with the most powerful and most popular custom contact forms WordPress widget! create your own forms in seconds! Tyche Properties enables you to easily override default template files using a child theme. It also enables you updating your theme in the safe way! Tyche Properties is based on most popular, well established, powerful vafpress theme options framework! Extensive documentation plus great video guides on how to setup and customize Tyche Properties will make your customisations super easy and fast! Tyche Properties looks great among all major browsers including IE9+.